The Hum is a new indie horror project that actually went up on Steam Greenlight in mid-May and made the cut shortly thereafter, but this story trailer just hit the Tubes on the weekend and it's really quite impressive. Some of the dramatic pauses in the narration are held a little too long and it's not exactly loaded with insight into what we'll be doing in the game, but as "cool setups" go it definitely has my attention. "The Hum," according to Wikipedia , is a phenomenon "involving widespread reports of a persistent and invasive low-frequency humming, rumbling, or droning noise not audible to all people." 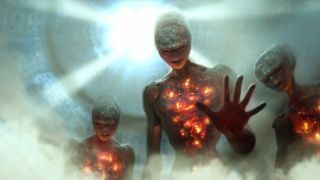 They exist in one form or another in various parts of the world, and they're fascinating because while they may bother a large number of people, it's often difficult or flat-out impossible to tell where they're actually coming from. Maybe they emanate from industrial machinery far off in the distance; or maybe it's the harbinger of an alien invasion that brings the entirety of the human race to its knees in mere days and then traps the survivors in a psychological hell from which there is no escape. The description on the Steam Greenlight page is equally intriguing. "The Hum is a horror game set in a world that has been destroyed by a sudden alien invasion. You will play the role of a survivor hiding in a barn since the invasion, months ago," it says "But, something strange starts to happen. Every day, every night, you wake up with new memories, new abilities, new paranoias." It will take place from the first-person perspective and include standard stealth gameplay, "but you will suffer constant abductions that will alter your sense of reality and will break down your deepest beliefs." It's indie and it's very early in the development process, which are two good reasons not to be too overly invested in a wildly successful and fulfilling outcome. On the other hand, the horror genre is virtually ruled by indie studios these days: Games like Amnesia , Outlast , Slender and Huntsman do things that major publishers, at least until recently, wouldn't even think about. Furthermore, the developer of The Hum claims he's also a therapist, clearly implying that he's not above using his intimate knowledge of the human psyche to scare the crap out of players, and it's being developed to support the Oculus Rift, for those who prefer to immerse themselves into a living nightmare that can't be escaped by simply looking away. No launch target has been set but an Early Access release is probably going to happen. In the meantime, you can keep up with what's what at TheHumGame.com .